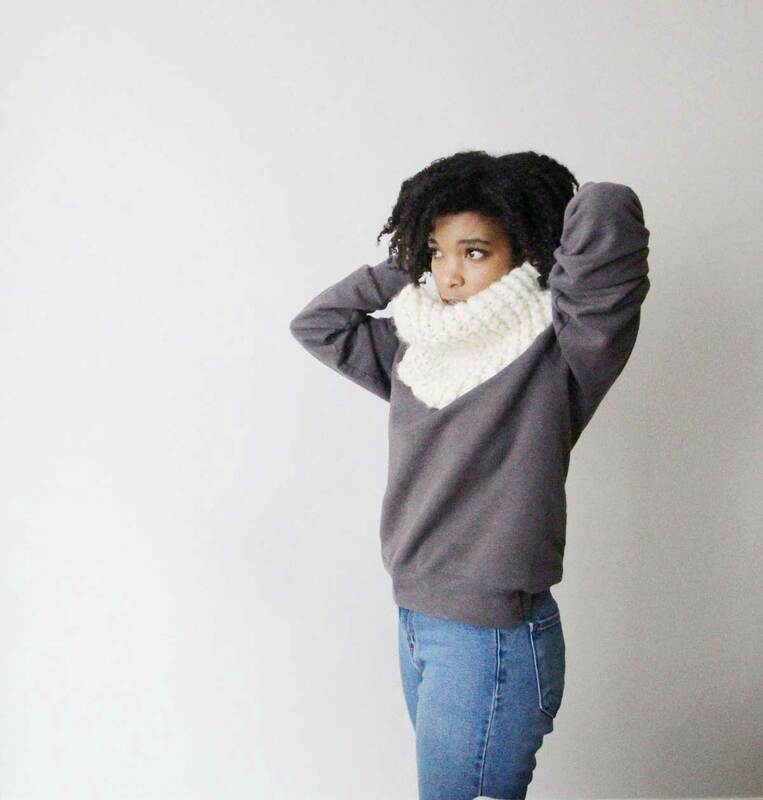 Jewell is the shop owner of NorthKnits Handmade Knitwear and the founder of Our Maker Life, a knitting and crochet movement for makers by makers. Our Maker Life (OML) seeks to inspire and educate makers online and through OML meetups held annually across the world. 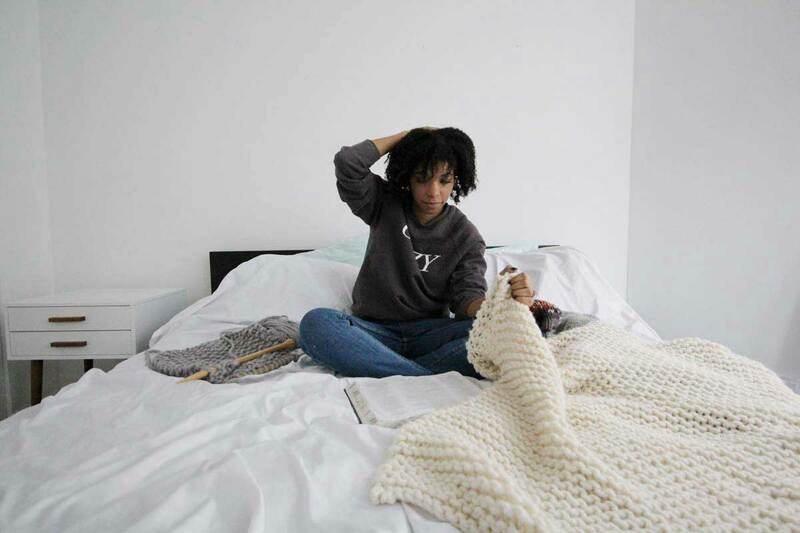 As a maker and OML's founder, Jewell has discovered her calling in creatively connecting with knitters, crocheters and maker community leaders. A South Carolina native, she currently enjoys love, life and local yarn stores at her home in downtown Chicago. I believe there is an unspoken love in every stitch. 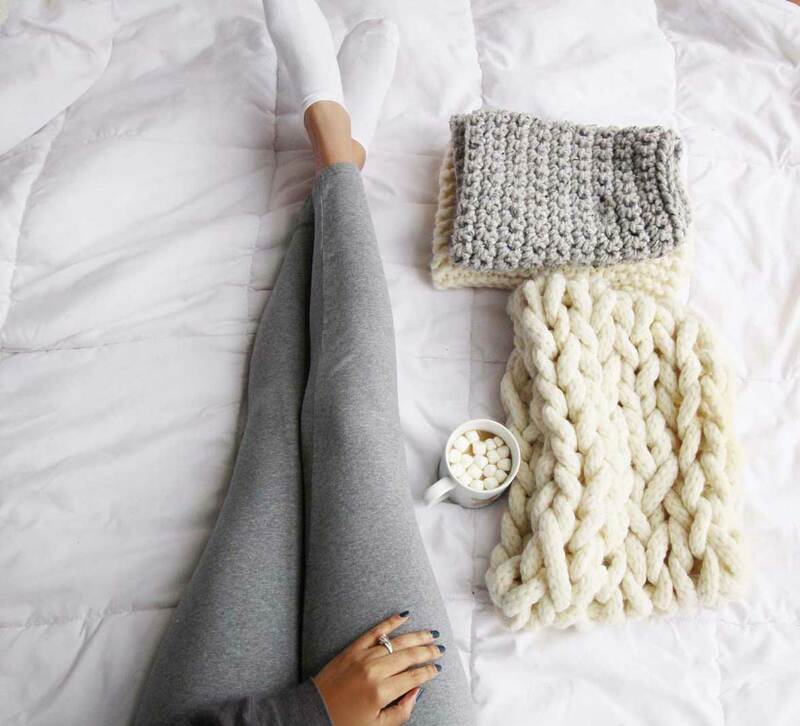 In every knitted piece. In every crochet caption and photo lies an unequivocal language of love, that with the click of our needles you can almost hear. That as we cast on and complete beautiful row after beautiful row, you can almost feel. A love that you cannot help but sense in the air around you. Its aura is grand. Sometimes it is grandiose. But it is there, even when we think it is not. If you would have told me years ago that I would come to know of that love with a breadth and depth, where words to describe it are joyously difficult to find, I would not have believed you. If you had told me that I would be apart of founding an international maker organization and community that would reach more than 50,000 people in two years, I would have doubted you. Because the truth is at the beginning of 2016, I did doubt. I heard my calling. That calling of unspoken love, and yet it was hard for me to believe. But I had a heartbeat to make. In fact, I had been making for more than ten years when I felt a desire to reach out to four wonderful fellow makers (and now my lifelong friends) to begin Our Maker Life. At the time, we had no name. We had no website or live platform. We had no hashtag or event or sponsors or pretty features and highlighted stories to share. We simply had a passion and an authentic belief to do something that felt connected to our own heartbeats. Our Maker Life, a movement for makers by makers. It just sounded right, and more importantly it felt right. We loved to make. We found joy in knitting and crochet, and we were good at it, with thriving businesses and social media followings of our own and we knew there were others who were like us. We believed there were so many others, so many strong businessmen and women, an entire community of wives and mothers, and students making with a heartbeat of intense passion and love. We were in this together, and as we brought the Our Maker Life organization to life, we kept that as our focus and center. And as we’ve grown over the last two years, featuring thousands of makers and their shops, and meeting up with hundreds across the world (New York to Canada, and now this year Chicago) we keep in mind that the maker life is not solely about quotes for numbers and profits, as much as it is about passionate heartbeats. It is why I love OML so much. It is why I love my own knitting shop and business, NorthKnits, and even on the nights when I get less than 4 hours of sleep balancing it all, I stop and think of our heartbeats. Deep down in our hearts is where it begins. And I know within our heartbeats to make, there is a journey for life-fulfilling contentment. Everlasting Joy. Long-suffering (or what my OML team and I like to call ‘avoiding the life yups’). Because my ten years leading up to OML was not easy. My maker story starts with me just being a girl who struggled with anxiety and depression, and looking for something different. Searching for something where things and people didn’t make me cry. 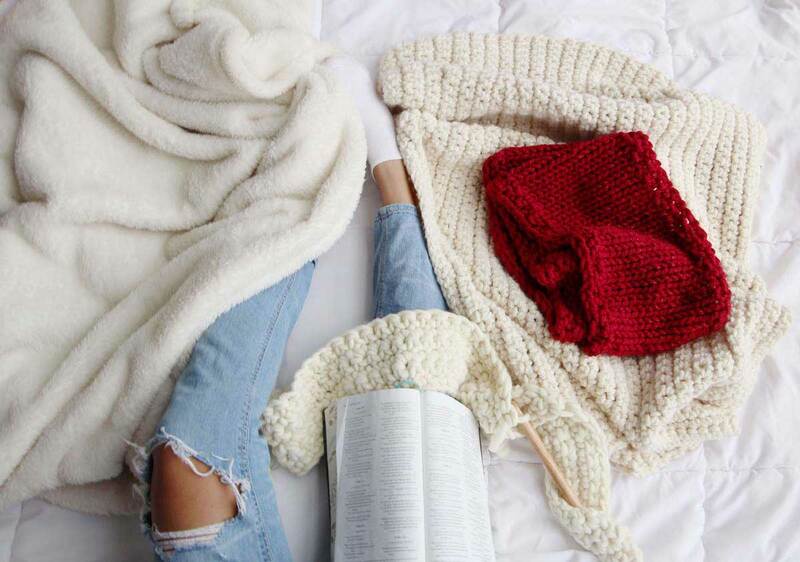 I looked for peace and contentment, and I found it in knitting. 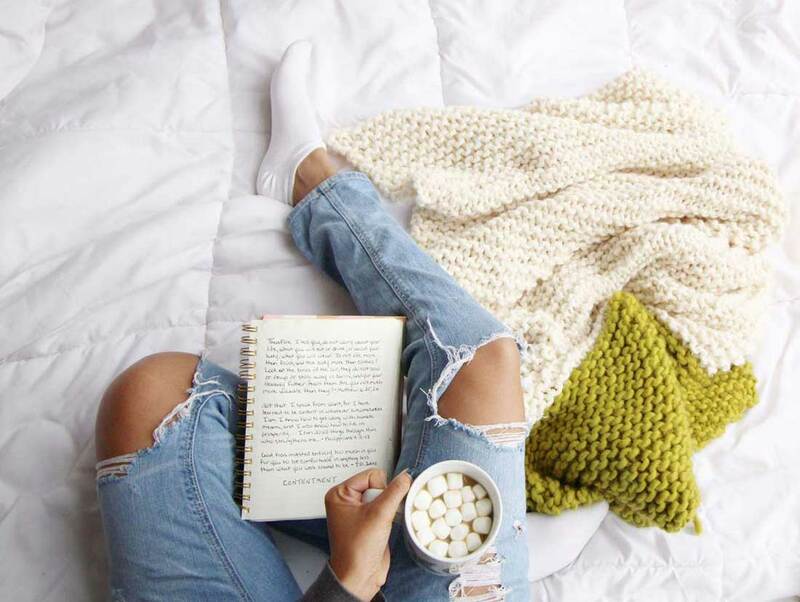 Knitting and journaling, and just being in my own thoughts to pray, and to ask for Heavenly guidance forever changed my life. Some would say that I gave into the popular idea of finding Christ, but I believe it was just the opposite – Christ found me. I grew up poor, my parents divorced when I was 5, and for a long time I felt worthless. I felt bitter and abandoned. I felt as if I was on a life sprint to nowhere. I was ambitious and biblically knowledgeable, but found little purpose in my life. And then, I went to my first knit night in college and learned how to cast on 40 stitches. In that very moment, I knew my calling was connected to that yarn. 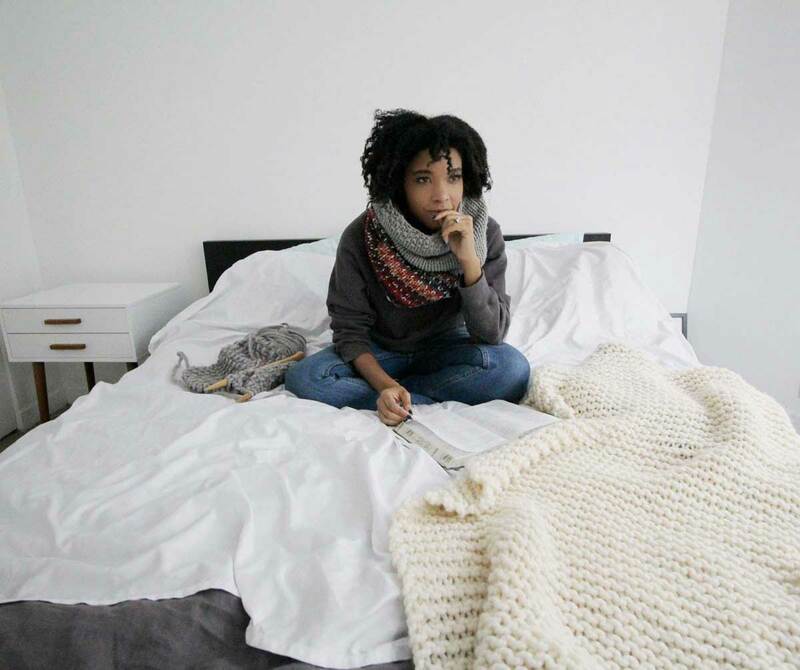 I felt it heavy on my soul as I sat in my dorm room for hours praying and teaching myself how to knit a garter stitch scarf. It made me believe, and the good lord gave me confirmation, that I was here on this earth for a reason, and He was here to show up, help me weather my storms, and straight up bless my life. That was my first quiet time moment in 2006 or so. And I haven’t stopped since, year after year, I’ve sought my peace and contentment in quiet prayerful moments where I let God know that I trust Him, and that I’m so here for cozy-filled blessings. My shop name NorthKnits is my spiritual acronym (n.o.r.t.h.) and reminder that I always need, obey, rejoice and thank Him. Years after I picked up knitting and a couple of years after obtaining my masters degree, I taught myself crochet. It was a new skill for me, but whether I am knitting in the round or casting on with my 15 mm hook, my patterns and pieces always begin with my NorthKnits center (and lately I’ve been all about making cream crochet blankets. 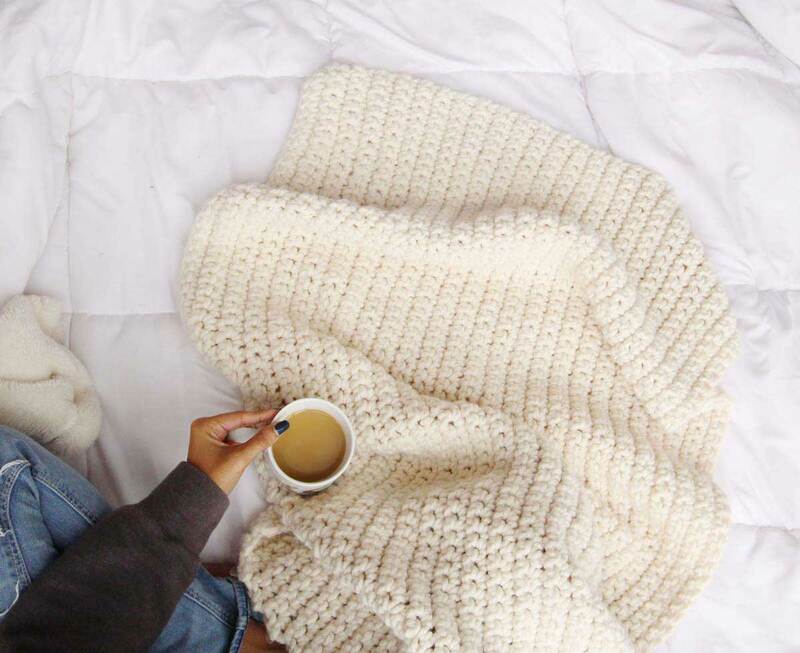 #alltheblankets #allthecoffee). I know that we are unable to peer into one another’s heart and truly know what lies within. But I have no doubt that Jessica of The Hook Nook knows all about that unspoken love to make. She showcases it in every one of her stitches. In her knitted pieces. 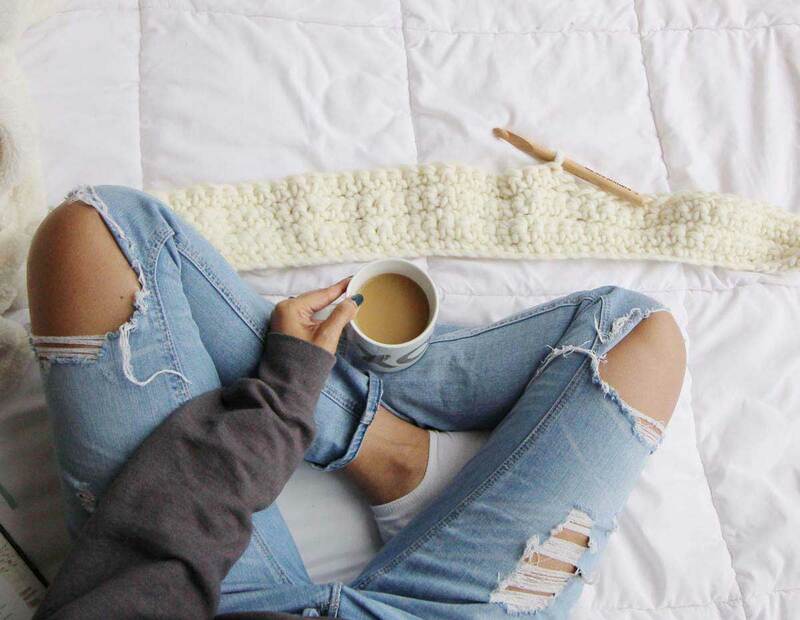 In all her beautiful crochet captions and photos lies her unequivocal love language for makers, that with the click of the needles I know she can hear. This website is a culmination of that, and what has been planted in her, I know will reach grand heights. Jessica has reached more than 100,000 in her maker community and she is among the most humble and sweetest people I have ever met. Her demeanor in person is as lovely as it is online, and it is easy to tell that her center goes deeper than the numbers and competition, and rather is embedded in the community. I am so excited to be able to share my maker story here on her blog, and I am thrilled to read so many more stories that she and her team have planned to help share.Because we all have different heartbeats. We all have something valuable to offer and something beautiful and unique to make. And that (plus a good cup of coco with marshmallows) is what the best part of our world, our maker life – our heartbeats - is truly all about.